So you want to go to Everest ? You are out of your mind…but you’re in good company. This past September, I made it to Everest Base Camp with Ian Taylor Trekking and it was an unbelievable and life-changing experience. A year ago, I made the decision to go to Everest Base Camp. A friend’s 18-year-old daughter had just died and in the face of such a tragedy, I couldn’t help but think about what my hopes and dreams were when I was 18 years old. The first thing that came to my mind was Everest. I’d read Into Thin Air in 1997 and had been fascinated by its pull. I told myself I’d go there one day. All these years later, “one day” had never come and knew it never would if I didn’t make it happen. Researching the EBC trek is a major undertaking. In typical fashion, I didn’t start with the rainbow and sunshine version of EBC treks. 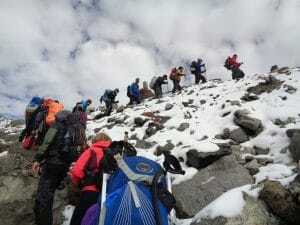 I researched all the things that could go wrong on high altitude treks and mainly found that altitude sickness is what you have to watch out for. 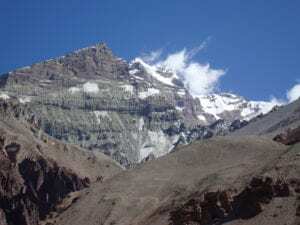 Ian Taylor Trekking had the most conservative itinerary to allow adequate acclimatization and it’s something that Ian and his company take very seriously. Almost everyone in the group told me that the attention to acclimatization and their confidence in Ian’s hands-on, thoughtful approach to the trek is what sold them on his company. Once I booked with Ian’s company, he walked me through all the specifics for the trek, including his training regimen, which can also be found on the website. 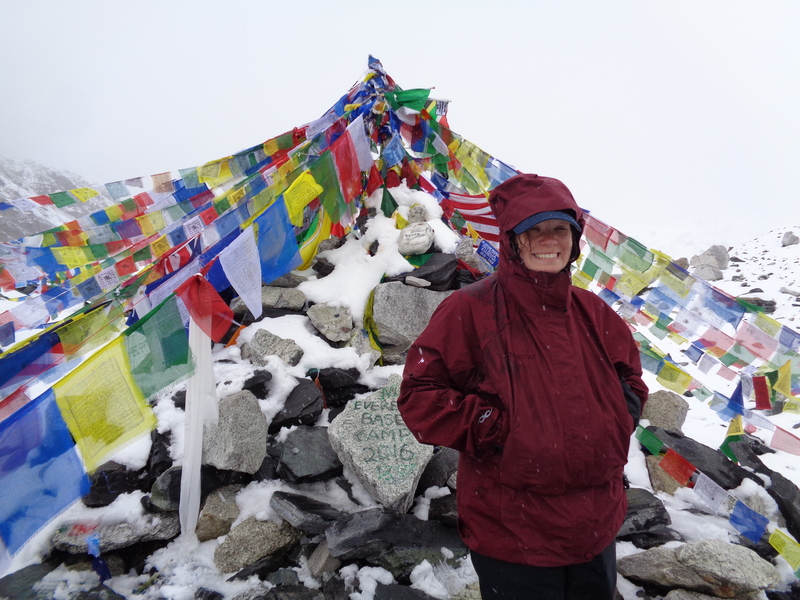 After completing the trek, I can tell you this: Normal people can go to Everest Base Camp. You don’t have to be a marathon runner or much of an athlete at all. I lost 50 pounds to do this trek over the course of 9 months. 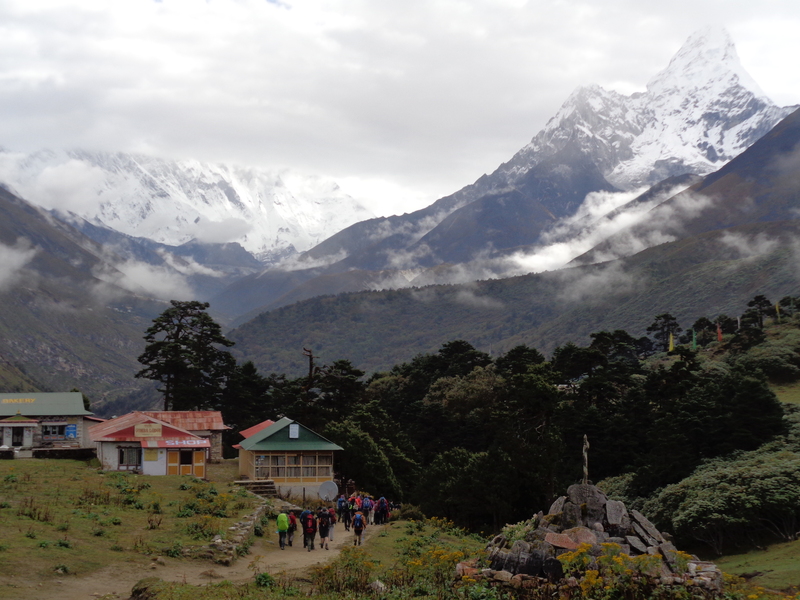 Really, before I ever set foot in Nepal, the EBC trek had changed my life. I felt so much better physically and mentally by the time I went on the trek. What is needed on this trip is reasonably good physical health and the will to go past your limits. You think you’re going to Nepal for the views and sightseeing. I went to Nepal thinking I was going sightseeing. It’s laughable now. The EBC experience was so much more that postcard photos. From the moment I stepped foot in Nepal, I felt welcomed by the friendly, lively spirit of the Nepalese people. Dawa and three other Sherpas met a fellow trekker and me at the airport and whisked us off to the very modern Apsara Boutique Hotel, where we had a great night’s sleep and breakfast in the morning. Dawa’s wife, Kay, took some of us sightseeing in Kathmandu (both before and after the trek), taking us to the Monkey Temple, Durbar Square, and bustling local markets close by. The weather was less than ideal when I went to base camp. The typical monsoon season ends in early September, but this year, it lasted into October. There was some sort of precipitation each day. 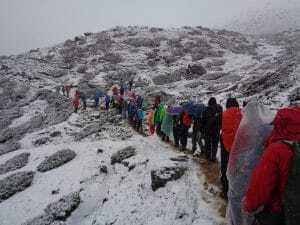 There were limited or no flights to Lukla, the official starting point of the trek, for the first three days of the trek, which cut into the trekking (and also the acclimatization) schedule. A small group of us were delayed in Kathmandu for the third day while the rest of the group had made it to Lukla before the weather closed the airport. 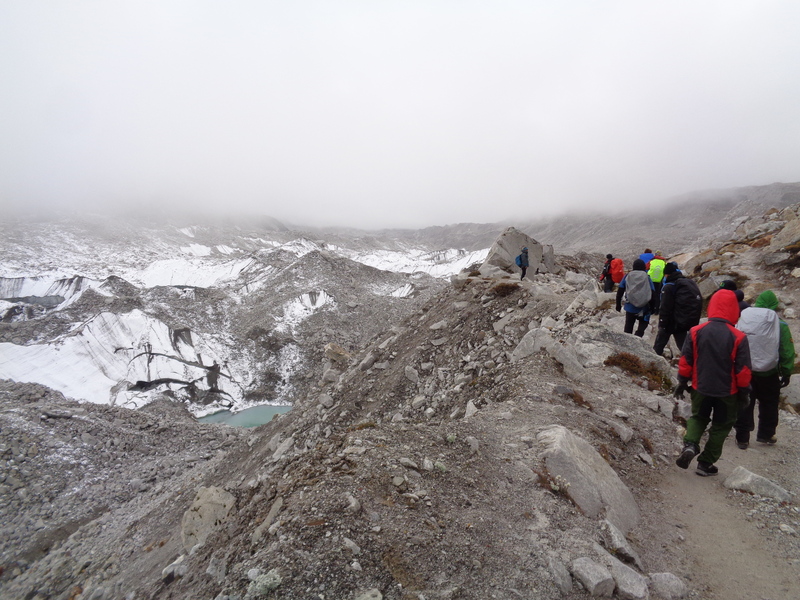 We ended up having to fly in higher up the trail (to Namche Bazaar) than the rest of the group, which also made acclimatizing more difficult. However, the alternative would have been that we’d have virtually no chance of making it to EBC in the time frame remaining on the trek. It was a difficult pill to swallow because I wasn’t expecting it. I had to accept that my goal of EBC still might not happen if I didn’t acclimate well. I was so worried by the time I got on the helicopter, I thought I would be sick….but then we reached the mountains and all of that was forgotten. Namche Bazaar sits at 11,290 feet and while it’s not the ideal starting point, we had two and a half days there to adjust to the altitude before setting off. What I remember after Namche Bazaar is a hodge podge of experiences along the way. 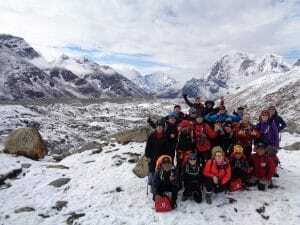 No doubt anyone going to EBC has scoured you tube and has seen videos of the trek. You see smiling Nepalese everywhere, Buddhist monuments and monasteries, prayer flags, mountains, snow — but seeing it is nothing compared to experiencing it. The chanting monks in Tengboche were moving and despite being exhausted, I felt a remarkable sense of peace while in the monastery. Although it was cloudy a good portion of the time I was on the trail, I awoke to a beautiful sunrise over the peaks surrounding Tengboche and caught my first glimpse of Mt. Everest. It was a beautiful moment. The Everest memorials were both heartbreaking and uplifting. Ama Dablam was in the background as if watching over the memorials. I was deeply touched by the inscription on one of the memorials: Love is kind, love is patient, love never fails. It’s sad to see so many people who have died on the mountain, but I also think having been there, in the shadow of the Himalayas, I understand the pull of Everest and other big mountains. Being in their presence is humbling and there is something profound about breaking through mental walls. It’s what makes getting to EBC so sweet but it’s also what makes not making it to EBC still worth the journey. To put it another way, once you’re in the situation, the destination is secondary to the journey. In Dingboche, we sang and danced with our Sherpa’s as they recorded a music video to raise funds for rebuilding a village damaged by the April 2015 earthquake. The video starred one of our Irish trekkers and Ian, who were outfitted in traditional Sherpa clothing and playing a a drum and banjo. 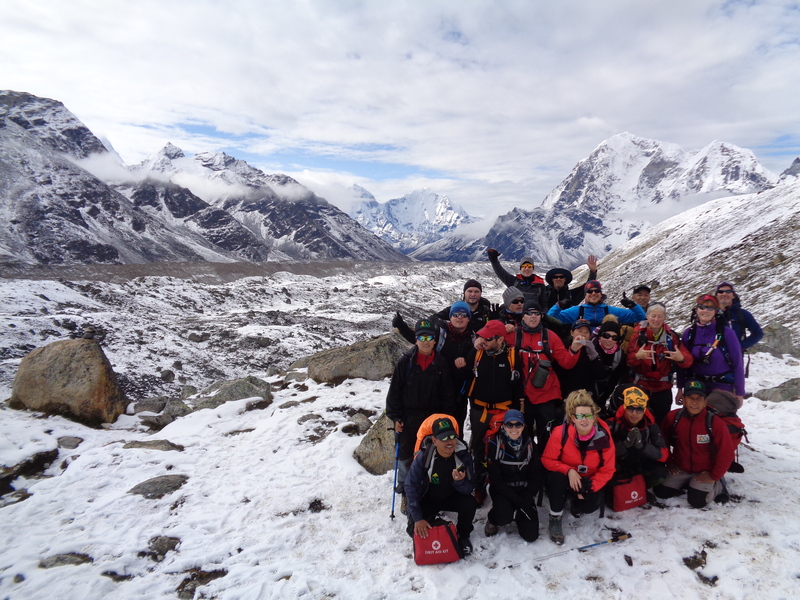 We loved our spirited Sherpa’s who worked hard to keep all of us comfortable and taken care of. What can I say about EBC? The final leg of the trek is only challenging from the standpoint of altitude. After we hit about 16,500 feet, my balance was off and I felt pretty unsteady on the downhill sections or stepping off rocks (and there are a LOT of rocks on the path). 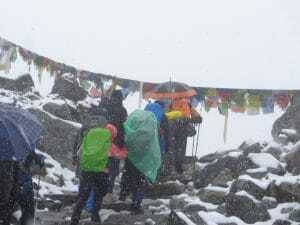 My shoes did not have great traction and snow had made the rocks near base camp slippery. Ian and the Sherpa’s had to sort of slide me into base camp. Once there, though, I was amazed by the place. Below the markers and prayer flags that designate you’ve made it, base camp spreads out for a mile and is nestled by the Khumbu glacier surrounded by mountains. Pictures are ridiculously inadequate. The entire group celebrated and congratulated each other on a job well done. We had accomplished something really special, something we’d all dreamed about for eons, and we did it together. 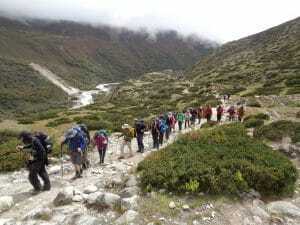 After the visit to EBC, we began the journey back to Lukla. It takes three days to return, which makes for long days of hiking, but it’s a relief to descend and breathe easier. We said goodbye to the folks in our group who were going to climb Island Peak (all of them summited) and made our way back to Kathmandu, where we had a celebratory dinner. The whole experience flew by and I miss it though it’s only been 6 weeks since I returned home. Altitude sickness is a…temperamental thing. Everyone is pushed on this trek and the altitude is a great equalizer. The uber triathlete and climbers all suffered at altitude. After three days of flight delays, three other trekkers and myself started the trek at 11,290 feet. For me, I had headaches sometimes that was relatively easily treated with hydration, ibuprofen, and resting. I completely lost my appetite by the time we left Namche Bazaar and ultimately, it didn’t return until we were back in Lukla. Eight days of eating the bare minimum to keep me on my feet while also working hard at altitude is its own kind of misery once you’re only 2 hours into a 5 or 6 hour hike and your body feels out of gas. The unexpected physical effect of altitude was my balance was affected once I was closer to base camp and that continued for the duration of my time at altitude. Everyone in the group felt the effects of altitude at one point or the other, except from one superhuman Brazilian in the group. The point is you never know how altitude is going to affect you. Trust your guides to help you mitigate whatever symptoms you inevitably experience. Pack light. I over packed and seemed to have much heavier items than others and suffered for it. 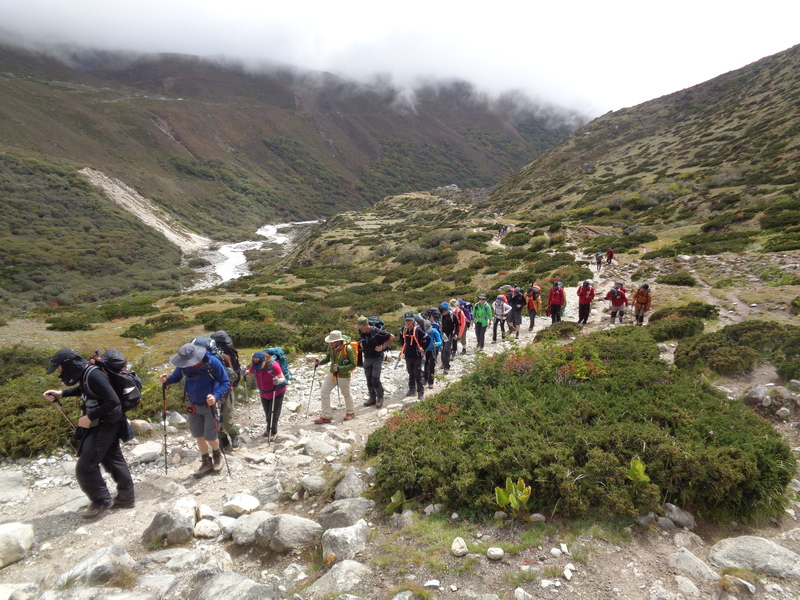 Ultimately, one of the Sherpa had to help me with my pack near base camp, which was the worst part of the trip for me. The Sherpa’s are gracious and were happy to help, but I felt incredibly guilty for burdening them with my pack. Become a strong hiker and build endurance. I walked on the treadmill at the max incline as Ian suggested four times a week. Toward the end, I added another day to it. On the weekends, I would get outside and go for long half-day or day hikes with my pack. EBC isn’t hard hiking but you have to be able to keep going. The last two days for me where the most challenging because you have 13 miles each day to cover. If you’re not a water drinker, become one. Practice drinking loads of water while you’re at home so it’s not such a struggle when you get to Nepal. I didn’t have this problem because I’m used to it, but several of my fellow trekkers found it difficult to drink enough and it made them feel bad at altitude. Five liters is the minimum you should drink. If you sweat, plan on drinking more. Take energy bars. I took trail mix but ultimately, it was too cumbersome on the trail for me and my big bag of it was too heavy. Get the OK from your doctor. 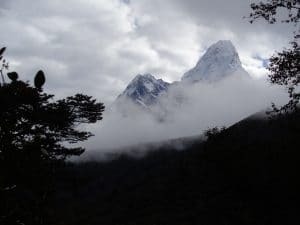 A lot of people hate going to the doctor but you really do need to get the all clear that you are fit enough to do an activity as physically challenging as multi-day hiking at altitude to the tallest mountain in the world. Because I had weight to lose, I had regular appointments with my doctor to monitor my progress and overall health. My doctor set one goal, which I met, but I actually wanted to lose another 15 pounds before going on the trip. Losing the extra 15 would have made a big difference in how I felt. Every ounce makes a difference, whether you’re carrying the weight on your body or in your pack. Accept Mother Nature for who she is. The weather will do whatever it wants. You can’t change it, so you have to be able to accept it and make adjustments. Aside from the flight delays, the other major impact for me was the challenge on the trail itself while raining or snowing. It made the trail slippery. The dampness in the air also made it really difficult for clothes to dry. Other people used dry bags and seemed to have better luck keeping their clothes dry. Take a chance and believe in yourself. You can do this. Seriously. Despite the challenges you will face, you can make it to EBC. Everyone suffers on a trip like this. Do what you have to do to reach your goal. Cry, laugh, sleep, whatever. When all else fails, take one more step. If you can’t do anything else, you can take one more step…so put one foot in front of the other and let your legs do what they do. Be prepared for surprises. I hated the “rest day” in Dingboche. The rest day was not so relaxing as we hiked to the highest point we’d been thus far. I struggled big time. I feel behind the group and thought I’d never catch up. My body was sapped of energy and mentally I was near exhaustion. At one point, I don’t think anyone on the mountainside thought I was going to make it to the group, but I’d come to Nepal to go as high as I could safely go. So, I resolved to put one foot in front of the other for just a little bit longer and then, finally, I joined my group. I promptly burst into tears because I was so happy that 1) I’d pushed passed a mental block and 2) Ian wasn’t going to make us go any higher that day. You’ll be amazed at how much easier that one more step can be when you have a group who supports you. I think my group wanted me to make it up the hill as much as I wanted to. Everyone says EBC is a trip of a lifetime, but I hope that’s not true. I hope I have many more trips like this one and that this trek is only the start of a grand adventure in the Himalayas. Ian, Laura, the Sherpa’s, and my fellow trekkers helped to make my crazy pipe dream a reality and I’m incredibly grateful to have had their support and encouragement every step of the way.